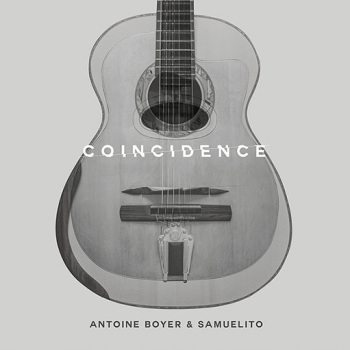 Antoine Boyer & Samuelito met at the Conservatoire de Paris in Gérard Abiton’s classical guitar class. They soon started to play together and developed a new duet repertoire combining different influences and techniques (jazz, flamenco, classical, pop…). They played their first concert together at the Issoudun Guitar Festival in 2014. This year (2016), their performances at the Samois Django Reinhardt Festival and Djangofest Northwest (Seattle) have earned them standing ovations. They also won the 4th European Guitar Award in Dresden, as a result of which they will appear in several concerts and have just recorded an album (Coincidence) with the label Doctor Heart Music. Antoine Boyer & Samuelito’s personalities naturally blend together to explore a whole range of esthetics. Each of them discovering the other’s music, they interpret Django Reinhardt and Paco de Lucía… but also other musicians like David Bowie or Roland Dyens. In addition to their arrangements, a new musical universe is born from their own compositions, specifically composed for the duet. Their respective steel/nylon techniques merge and form one unique sound, and their compositions (Double sens, Si fuera realidad…) have already captured the imagination of enthusiastic audiences in many countries.